The inventory screen in BV shows the committed and back order quantities of Sales Orders, as well as the quantity on Purchase Order. Sometimes these quantities can get out of sync with the actual order quantities due to system glitches. The quantities can be reset for all items using the ‘Reorganize’ function. You must have user access to reorganize files, as determined in Utilities/System Manager/User Details/Access tab/ Utilities/Reorganize data files. Make a quick backup of the Invent.btr file from your current data directory. See https://ritabloem.com/bv-technical-tips/quick-backups-of-data-in-bv/ for guidance. 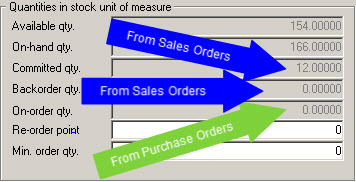 Select Inventory; select Recalculate On Order/Committed quantities; click on the Reorganize icon. The routine will take from a few seconds to 15 minutes depending on the size of your inventory file and the speed of your computer and server. If you get a message indicating ‘Not Responding’, do not panic! This is a Windows message that usually erroneously tells you there is a problem. Give the system more time and eventually the message clears and the routine finishes. If you forced to abandon the routine, you may have to re-instate your backup copy of the Invent.btr file. If so, simply delete the current one in the data directory, and copy over the backup you made in step 2.